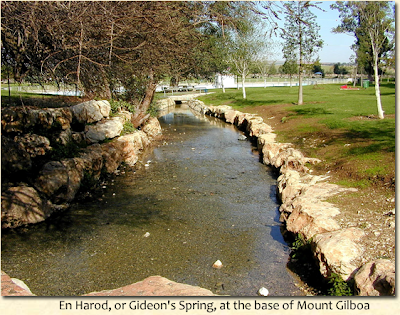 At the base of Mount Gilboa in Israel, a spring still flows today as it has for millennia. Green grass, a swimming pool, and beautiful picnic spots surround the spring that takes its name from the valley that spreads before it. Years later, a fearful King Saul failed to learn the lesson Gideon had acquired in the same area. On the northern side of the Hill of Moreh, the city of Endor had a resident medium that Saul visited in a frantic attempt for supernatural information. Surprising even the medium, God revealed through the Prophet Samuel that Saul would die the next day (1 Samuel 28). The army of Israel fought the Philistines on Mount Gilboa, and King Saul and his sons were killed. Their bodies hung in effigy on the walls of nearby Beth-shan until Hebrews from Jabesh-gilead recovered them (1 Samuel 31). Centuries later, the southern side of the Hill of Moreh saw the Prophet Elisha raise the dead son of a woman from Shunem (2 Kings 4). How interesting that two sets of desperate situations occurred in the same area. 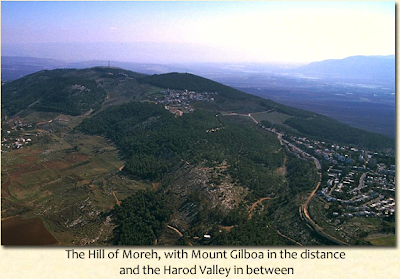 For Gideon and Saul, it was tremendous odds in battle at Gilboa. For Elisha and Jesus, it was the death of a mother’s son beside the Hill of Moreh. In every instance, the lessons pointed to the same principle: God alone provides the necessary strength for overwhelming situations—even in circumstances as crushing as death. I find it fascinating how the lessons taught in these places offer truths as enduring as the beautiful settings in which they occurred. Images courtesy of Todd Bolen/BiblePlaces.com. Our culture’s favorite statement of Jesus is, “Judge not, lest ye be judged.” This is not an excuse for tolerance, but it is an indictment against hypocrisy. God’s ways of working in our lives are often confusing. But in the end, we see that His confusing paths were the best after all.